Most scientists who incorporate animals in their research do so under the strong belief that modern animals (particularly those closest to us in evolutionary terms) exhibit an amazing genetic, physiological and behavioral similarity to Homo sapiens, making them effective model systems in which to understand both humans and animals alike. This is particularly true of monkeys and great apes, and it is the reason that primatologists and physical anthropologists have – for nearly a century – studied these species in the wild and in laboratories. They believe that apes and monkeys are so similar to us that this study can reveal insights into the origins of the human species, to our culture and to our evolutionary history. This homology is not just contained solely within the primate family, however. Dogs also share a remarkable amount in common with us. This is probably because the human species has spent millenia shaping the genome of the domesticated dog through selective breeding in order to make it an ideal companion who shares our emotional and cognitive lives. Not long ago, it was shown that domesticated dogs have a unique ability to understand the social cues embedded in subtle human behavior, like eye gaze, while many chimpanzees do not. This is probably why we favor them as companions – they seem to understand our thoughts and emotions because they have this ability. Importantly, many patients with Autism Spectrum Disorders have difficulty with understanding the thoughts and feelings of others, impairing their ability to relate socially. This suggests that the study of domesticated dogs may provide a unique opportunity to explain the basis of aspects of autism. We can ask what is it that differentiates dogs from other animals that conferred upon them this ability to understand the minds of others. We can then test whether interventions that work through that mechanism are useful treatments for social problems in autism. A recent paper by researchers in Boston, published in the journal Molecular Psychiatry, further exposes the potential for bio-behavioral studies in dogs. 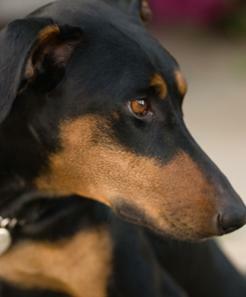 These scientists noted that a significant number of Dobermans had a tendency to engage in behaviors reminiscent of human Obsessive Compulsive Behavior (OCD; including abnormal self grooming – called trichotillomania – and other repetitive motor movements like pacing and checking). By studying a large family of Dobermans who exhibited these traits, the scientists were able to show that there were genetic causes to the behavior and to provide evidence that mutations on dog chromosome 7 were associated with these symptoms. Upon further analysis of their data, they identified an interesting gene (cadherin 2) which is expressed within the brain and may directly relate to these behaviors. We now have an important set of questions to test: what brain circuits is cadherin 2 expressed in? Does the same gene, which is known to be present in humans, relate to OCD? If so, can we treat the symptoms and lessen the distress of patients with OCD by targeting this gene? The millions of patients with OCD undoubtedly await an answer to these questions. What is more, we now have important information that may help to make the lives of these dogs better through lessening the behavioral problems they have inherited through their genes. Of additional note, these researchers made this discovery by observing the dogs’ behavior and by obtaining a blood sample, revealing the fact that – as many researchers have long asserted – the descriptions of all biomedical research as “vivisection” is a far cry from the truth. Scientists typically refine their approaches in order to use the least invasive and distressing methods to uncover the facts that are required. This is particularly true when considering complex species with evolved cognitive and emotional abilities – like dogs and monkeys. I personally care for two small dogs, and because of this, I – like other scientists – am exceptionally sensitive to the impact of an experiment on the animals that live in our labs. It is with that in mind that we struggle to carry out our research in as refined a manner as is possible given the scientific question being investigated. Indeed, as I have previously asserted, there are many scientific questions that cannot be answered well if the welfare of the subject is ignored and/or if the animal is exposed to stress that will alter its behavior. While invasive methods are sometimes required to make progress towards treatments for human disease, at other times they are not. Researchers judiciously choose the method that produces the necessary data with the least impact on the subject, and Institutional Animal Care and Use Committees review the decision of any scientist about the level of invasiveness of his/her study. That not withstanding, studies in non-human animals continue to be foundational for our understanding of ourselves, and discoveries regarding the function of the brain and body in health and disease will continue to be made thanks to animal research. Posted on February 5, 2010 September 26, 2014 by EditorPosted in News, Science NewsTagged 3Rs, animal model, autism, david jentsch, evolution, genetics, jentsch, Psychology and psychiatry, social cognition. I do believe its crucial to dispute this “black or white” interpretation of animal use in biomedical research. Clearly, a good deal of basic biological discovery requires: 1) minimally invasive or non-invasive methods [this was articulated in my post] or 2) that involve no discomfort or distress in the animal subject. Other work does involve the creation of a disease process but often (agreeably – not always) also involves the use of pain- or discomfort-relieving interventions (anesthesia, sedation, analgesia, euthanasia, or the like). As a member of my on campus’s Institutional Animal Care and Use committee, I can assert that there are experimental procedures that I would not support – under almost any circumstance. There are certainly a larger number of procedures that I would only support if the benefits to the health and welfare of humans or animals was profound and apparent. As for experiments that generate knowledge only (with no apparent application to health), I would expect them to use methods that are non-distressing and/or to cause little or no discomfort. Gerald – there is plenty of research that would not be allowed by an IACUC (institutional animal care and use committee). You would not be able to burn any concious animal, and would have to give extremely good justifications to give any kind of burn injury to an animal while it was unconcious. You cannot mutilate a live animal. Where do you get this? If the data can be gathered while providing a better level of welfare then an objection may be made – or if the welfare of animals is not addressed in the protocol then an objection may be made. My point is that animals may be addicted to dangerous drugs, burned, mutilated, and killed if it is deemed necessary to gather the desired data. Social animals that require interaction with their peers may be single housed, etc. My point is that if it is deemed necessary to gather the data and the requisite paperwork reflects that – then there is nothing that cannot be legally done to an animal. Perhaps you could offer a counterexample? I’m afraid you’re very wrong about the needs of the experiment trumping even the most fundamental needs of an animal. I’m not sure where you’ve gotten you’re information but you should recheck your facts. In the future please don’t post vague and incorrect statements. I understand that such statements are popular among your ilk, but it doesn’t serve your purpose because it’s blatantly untrue. I’m really not sure where you came up with the idea that the nature of the experiment dictates the level of welfare the animal receives. That’s just not true. The veterinarians take their role very seriously and experiments have been denied or changed because the welfare of the animals was not properly addressed in the experimental protocol. I’d be happy to discuss the process with you sometime, assuming you want to listen. This is an amazingly unimpressive claim for it does not challenge the fact that the nature of the experiment dictates the level of welfare that the animal receives.